Reference number for this case: 18-oct-54-Cisternes-la-Forêt. Thank you for including this reference number in any correspondence with me regarding this case. Saucer, cigars, mysterious cylinders, crescent or balls, passionate the public opinion and theres is no day that passes without one collects testimonies often contradictory as of the forms, the dimensions or the speeds of the observed machines but indisputable as to the existence of mysterious craft. Over the weekend and yesterday many people have seen some intriguing devices. On Sunday evening, at nightfall, a farmer, Mr. Jean Augard, and a former miner, Mr. Jean Chazotte, saw in a field along the road a saucer-shaped machine surmounted by a dome, of a very bright white. Seeing this "saucer", the two men wanted to approach it, but hardly had they penetrated in the field that the craft rose without noise and disappeared, at a fast pace, in the direction of the northeast, leaving behind a slight reddish trail. Recall that some time ago a "saucer" had been sighted in Gelles, near Cisternes-la-Forêt. In our issue yesterday, we announced that two residents of Cisternes-la-Forêt (Puy-de-Dome) had sighted a mysterious machine that had landed in a field. Information obtained, we would like to point out that the craft was not seen Sunday night, but Saturday night around 9:30 p.m., by one of the two witnesses we quoted yesterday; and this craft was flying along an east-west trajectory approximately. We recall that Saturday around this time, people from Saint-Georges-de-Mons, Les Ancizes, Montlucon and Vichy observed the same phenomenon. "Following the article in your journal, which I am an avid reader, I want to re-establish the facts. "Saturday evening, October 16th, goint out of my home at 9:30 p.m., I saw a luminous roundness of the size of a plate, leaving a reddish trail of about three meters, ending in a cone. This gleam crossed the town of Cisternes, from east to west, and it was moving at great speed, and I never saw a craft posed on the ground." CLERMONT-FERRAND. -- MISTERS Jean Augard, farmer in Sisternes-la-Forêt (the Puy-de-Dôme) and Jean Chanzotte, former mine worker, stated to have seen, in a field at the edge of the road, an ovoid-shaped craft surmounted of a cupola of a brilliant white. As the two men approached the "saucer", it rose vertically and disappeared in direction of the North-East, leaving behind it a reddish trail. A few days ago, in Gelles, a nearby village, several people had seen a similar craft, also posed in a field. Aimé Michel reports in his book that on October 18, 1954, in Cisterne-la-Forêt, a few kilometers from Gelles and from Coheix, two people had seen an object on the ground which had the same shape as the one seen in Gelles this day, thus of ovoid shape. When the witnesses approached, it flew away quickly towards the North-East. This magazine indicates that in Mr. Augard and Mr. Chanzotte saw an ovoid object surmounted by a cupola of a brilliant white landed in a meadow. The magazine adds that an article of the newspaper La Dépêche du Midi dates the case of October 8 instead of the 18th. The magazine, as Jacques Vallée does, dates it of the 18th. The two authors and ufologists indicate that according to the sparse information in Jacques Vallée's catalogue and in the ufology magazine Lumières Dans La Nuit N.69, on October 18, 1954, in Cisterne-la-Forêt in the department of Puy-de-Dome, Messrs Augard and Chanzotte, farmers, saw an oval object topped with a dome and emitting a brilliant light, which was posed in a field. They approached and then the object rose vertically, leaving a reddish trail, and disappeared. Before concluding our intervention in the pages of this magazine, we would like to make some further clarifications that have appeared to us in the course of our investigations. 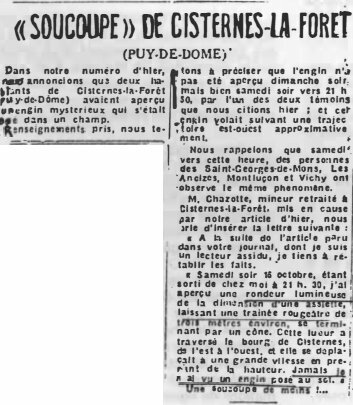 A "classic", Cisternes la Forêt, quoted by Jacques Vallée on October 18, 1954: "J. Augard and J. Chanzotte saw an oval object, surmounted by a dome, and emitting a bright white light, posed in a field. When they approached, the latter rose vertically leaving a reddish trail and disappeared towards the north-east." For a desirable cohesion, in a scientific spirit, it is obviously essential that rigor be everywhere present in the reports and the files. Mr. Vallée's text contains at least one error in the name of one of the witnesses, it is not about Mr. Chanzotte but about Mr. Chazotte. This may be actually to a printing error in the newspapers that were used as a reference. Mrs Gueudelot, archivist of LDLN, entered this case in her file, but in doing so, she introduced two errors in relation to Jacques Vallée: it is no longer about Monsieur Chanzotte, but about Monsieur Chauzotte; it is no longer about Monsieur Augard. but of Monsieur Augord. It goes without saying that such shortcomings and gross errors in the data, hinder in a seep way the results of the studies on which they are based. Ufologists with a neglecting mind should refrain from preaching rigor! We investigated this case and found, after many difficulties, a witness, Mr. Aucheard who explained to us that in the company of Mr. Chazotte they had been the victim of a hoax perpetrated by locals. Latest point of detail, the newspaper "La Dépêche du Midi" dates this case of October 8, not 18! The two authors indicate that in Cisternes La Fôret in the department of Puy de Dôme on October 18, 1954, at some unknown time, Mssrs. Augard et Chanzotte approached an oval object, topped by a dome, which emitted a brilliant yellow light, and was posed in a field. The machine rose vertically leaving a reddish trail and disappeared. The authors indicate that the sources are case 282 of the Vallée catalogue; Aimé Michel in "A Propos des S.V." page 241; L.D.L.N. #69; Combat and La Croix for October 20, 1954. We also notice that sometimes the object was seen in flight but in reality it was never seen on the ground. The press is often responsible for the landing. 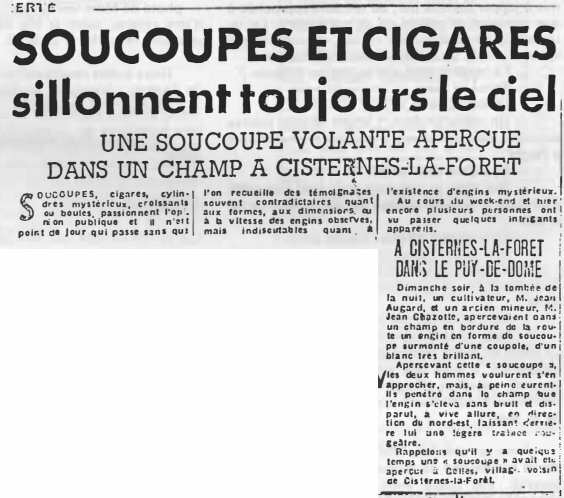 Case of Cisternes-la-Foret of October 16th, 1954 and not the 18th ... (See press clippings below). In an extract of his Francat catalogue, Michel Figuet recorded that the case occurred on October 16, 1954 and not on October 18, 1954 and that it was a fireball going from East to West according to a letter by Mr. Chanzotte to the newspaper "La Liberté" for October 20, 1954, the source being an article headlined "Heureux ceux qui croient sans savoir" ("Happy those who believe without knowing") in LDLN 240-250 [ sic ] page 21. The witnesses of CISTERNES were really MISTERS AUCHEARD and CHAZOTTE and not MISTERS AUGARD and CHANZOTTE but what wouldthis have changed if the phenomenon observed had been authentic. The authors quote: moreover, and it is written black on white in "France-Soir" for 10/1/1954, this incident is due to a confusion. Hold on! One refers in an article of press this time and surprize: it is of a confusion and not a prank. Note: Figuet answers a criticism by Gerard Barthel and Jacques Brucker. The latter would have said that Figuet believe the Press, this is why Figuet replies that it is Barthel and Brucker who believe the press, when the Press gives an ordinary explanation to a sighting. Figuet seems to think that Barthel and Brucker changed opinion on the explanation: hoax, then confusion; this seems not to be true if one refers to [bb2] below. If we criticize Mrs Gueudelot, it is not only for the case of Cisternes la Forêt, but for all of her "work". Her records are only errors. A minimum of severity is required. May she take as an example the work of Mr. Jeantheau, remarkable in order, rigor and precision. If Mr. Figuet wants to reread our article "Le ressac d'une vague" (9), he will see that for the case of Cisternes, we do not quote "France-Soir", but only J. Vallée; we could add "Combat" and "La Croix" for 10-20-54 and the G. Quincy catalog. 9) Inforespace #3 special issue, December 1979. The belgian ufologist indicates that in 1954, on October 18, in France, in Cisternes la Forêt, "J. Augard and J. Chanzotte saw an oval object surmounted of a dome and emitting a brilliant white light, posed in a field. When they approached, the object rose vertically, leaving a red trail and disappeared in direction of the north-east." 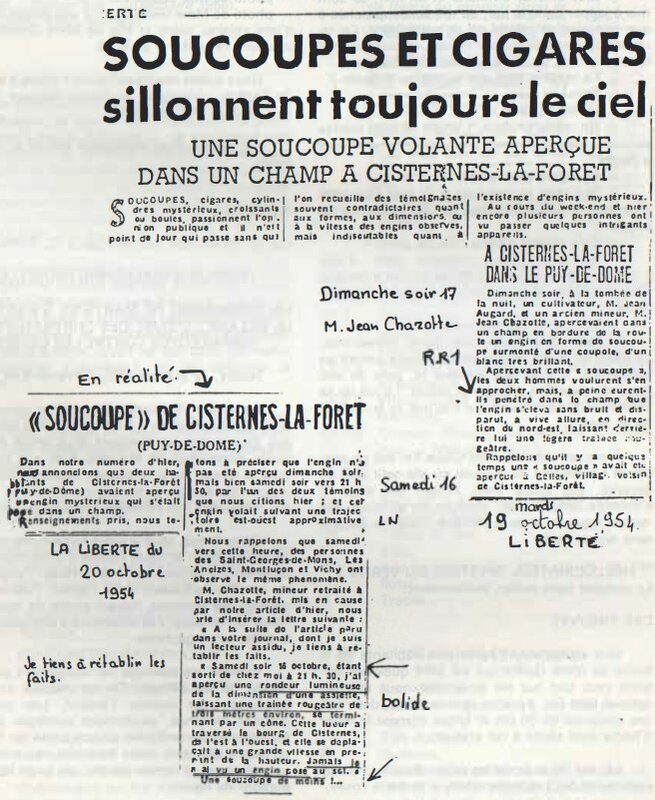 The sources are indicated as "Combat, La Croix, 20 oct 1954", "Jacques Vallée: 'Chronique des apparitions ET' - DENOEL 1972 - J'AI LU COLL. - p. 285". In Cisternes-la-Forêt (France), J. Augard and J. Chanzotte see an oval object, surmounted of a dome, emitting a brilliant white light, posed in a field. When they approach, it rises vertically leaving a reddish trail and disappears in the direction from the North-East. The sources are indicated as "Combat, La Croix, October 20, 1954". Luc Chastan indicates that in the Puy de Dômes [sic, Dôme] in Cisternes La Forêt on October 18, 1954 at an unknown hour, "the two witnesses approach an object oval, surmounted of a dome, and emitting a brilliant yellow light, posed in a field. The machine rises vertically leaving a reddish trail and disappears." The website indicates that on 18 October 1954 in Cisternes-La-Foret, France, "Domed disc lands in field. Takes off and flies rapidly to the northeast when approached by the witnesses." And: "An object was sighted that had an appearance and performance beyond the capability of known earthly aircraft. One domed disc was observed by two witnesses on a farm for over one minute (Augard)." The sources are indicated as Michel, Aime, Flying Saucers and the Straight-Line Mystery, S. G. Phillips, New York, 1958; Bowen, Charles, The Humanoids: FSR Special Edition No. 1, FSR, London, 1966; Vallee, Jacques, Challenge to Science: The UFO Enigma, Henry Regnery, Chicago, 1966; Vallee, Jacques, Preliminary Catalog (N = 500), (in JVallee01); Schoenherr, Luis, Computerized Catalog (N = 3173); Hatch, Larry, *U* computer database, Author, Redwood City, 2002. The website indicates that on 18 October 1954 at 17:30 in Cisternes-la-Foret, France, "An oval object with a dome, emitting a bright white light, was resting in a field." "Cisternes-la-Foret, France . Messrs. J. Augard and J. Chanzotte saw an oval object with a dome, emitting a bright white light and resting in a field. When they approached it the object rose vertically, leaving a reddish trail, and flew off toward the northeast." And: "J. Augard and J. Chanzotte saw an oval object with a dome, emitting a bright white light, resting in a field. When they approached it, the object rose vertically, leaving a reddish trail, and flew to the northeast." And: "An object was observed. Electromagnetic and physiological effects were noted. One red oval object, about 40 feet across, was observed in clear weather by one male 42-year-old witness (as reported to the police) and others in a forest for a few minutes (Augard; Bachelard). No sound was heard." *Oct. 18, 1954 - Cisternes-la-Foret, Puy-de-Dome, France. Messrs. J. Augard and J. Chanzotte saw an oval object with a dome, emitting a bright white light and resting in a field. When they approached it the object rose vertically, leaving a reddish trail, and flew off toward the northeast. (Sources: Aime Michel, Flying Saucers and the Straight Line Mystery, p. 198; Jacques Vallee, Passport to Magonia: A Century of Landings, p. 233). J Augard and J Chanzwtte saw an oval object with a dome, emitting a bright white light, resting in a field. When they approached it, the object rose vertically, leaving a reddish trail, and flew to the northeast. Possibly the meteor of October 16, 1954, at 09:30 p.m..
[ll1] Article in the regional newspaper La Liberté, France, October 19, 1954. [ll2] Article in the regional newspaper La Liberté, France, October 20, 1954. 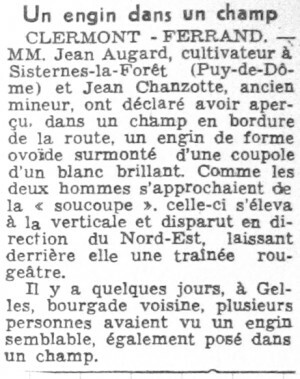 [lm1] Article in the regional newspaper Le Méridional, France, October 20, 1954. [---] Article in the national newspaper Combat, Paris, France, October 20, 1954. [---] Article in the national newspaper La Croix, Paris, France, October 20, 1954. [---] Article in the regional newspaper La Liberté, France, October 20, 1954. [---] Article in the regional newspaper La Dépêche du Midi, France, October 1954. [am1] "Flying Saucers and the Straight Line Mystery", book by Aimé Michel, English version of "Mystérieux Objets Célestes", S.G. Phillips publisher, USA, 1958. [jv1] "Un Siècle d'Atterrissages", article by Jacques Vallée in the ufology magazine Lumières Dans la Nuit (LDLN), France, #103, page 7, December 1969. [jv2] "Passport To Magonia - On Ufos, Folklore, and Parallel Worlds", book by Jacques Vallée, Contemporary Books publisher, France, USA, 1969. [jv2] "Chronique Des Apparitions Extra-terrestres", French translation of "Passport to Magonia", book by Jacques Vallée, J'Ai Lu publisher, France, page 285, 1972. [ld1] "Les Archives De 1954 Pour Le Puy-de-Dôme", in the ufology magazine Lumières Dans la Nuit (LDLN), France, #125, page 27, May 1973. [gl1] "Face Aux Extra-terrestres", book by Charles Garreau and Raymond Lavier, Delarge publisher, J'ai Lu, France, page 109, 1975. [am1] "Mystérieux Objets Célestes", book by Aimé Michel, Seghers publisher, France, page 265, 1976. [pr1] "INTCAT Part 9 - An International Catalogue of Type 1 Reports", compiled by Peter Rogerson, in the ufology magazine MUFOB, U-K., New Series #4, page 8, autumn 1976. [bb3] "Le ressac d'une vague", article by Gérard Barthel and Jacques Brucker, in the ufology magazine Inforespace, SOBEPS, Belgium, special issue #3, pp 42-43, December 1979. [fr1] "OVNI, Premier Dossier Complet Des Rencontres Rapprochées En France", book by Michel Figuet and Jean Louis Ruchon, Alain Lefeuvre publisher, France, page 183, 1979. [mf2] "Flux et Reflux", answer by Michel Figuet to Barthel and Brucker in the mail section of the ufology magazine Lumières Dans La Nuit (LDLN), France, #198, page 35, October 1980. [bb2] Letter by Gérard Barthel and Jacques Brucker about errors by Michel Figuet published in the mail section of the ufology magazine Lumières Dans La Nuit, France, #201, page 35, January 1981. [mf3] "Heureux ceux qui croient sans savoir - (Retour sur l'isocélie ou nouvelle confirmation de sa non validité)", article by Michel Figuet, in the ufology magazine Lumières Dans La Nuit (LDLN), France, #249-250, pages 20,21, March / April 1985. [mf4] "Catalogue Francat des rencontres rapprochées en France (Listing 800 1982) (2 - Suite)", list compiled by Michel Figuet, in the ufology magazine Lumières Dans La Nuit (LDLN), France, #257-258, page 19, November / December 1985. [mf1] "Catalogue Francat des rencontres rapprochées en France - Listing 800 - 1982 - 6 - Suite et Fin", listing by Michel Figuet, in the ufology magazine Lumières Dans La Nuit (LDLN), France, #265-266, page 17, July/August 1986. 0.1 Patrick Gross April 18, 2003 First published. 1.0 Patrick Gross December 27, 2009 Conversion from HTML to XHTML Strict. First formal version. 1.1 Patrick Gross June 30, 2010 Addition [jv5]. 1.2 Patrick Gross October 18, 2014 Addition [ni1]. 1.3 Patrick Gross October 20, 2016 Additions [lm1], [bb2], [mf2]. 1.4 Patrick Gross March 4, 2017 Addition [ub1]. 1.5 Patrick Gross January 14, 2019 Additions [ll1], [ll2], [pr1], [mf3], [mf4], [lh1], [pr2], [bb3]. This page was last updated on January 14, 2019.